With summer and holidays, we always have more time to read those outstanding books that have been on our list months and months. Usually, we do it on paper, sometimes in eBook but smartphones can also be a perfect format. The screen of the mobiles already offers an outstanding resolution, especially this year that the high end has made Full HD fashionable. If you are looking to read eBooks on your smartphones with high-end comfort, today we show you five applications to use this summer. 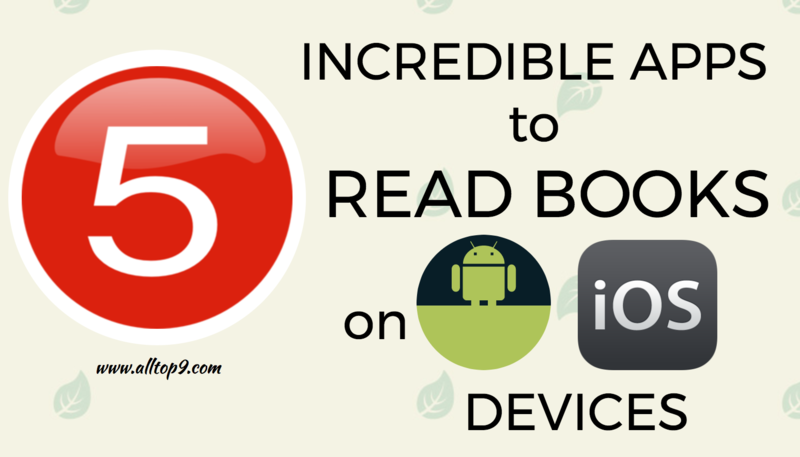 Here goes the list of 5 apps to read books on our digital devices. This application gives its users an unlimited and constantly expanding the library of free books and stories. In it, you’ll find over 10 million books and stories and will allow you to connect with your writers, get book updates and stories straight from their authors, read offline and customise reading settings. Wattpad is available for both Android and iOS devices. You can download this app from below links. With this app, you can access a large number of free books (approximately 5,000) or premium (over 195,000). With this service, you can read digital books of thousands of genres in several languages. The books are read through streaming, so you will not have problems with incompatibilities or formats. You can also create shelves, organise and place your ebooks. You’ll find it on iOS and Android. You can download this app from below links. This is one of the best apps to read books on digital devices. With this app, you can customize your reading experience to the fullest. You can read online and offline and resume reading where you leave it on your phone, tablet or computer. You can also add bookmarked pages, underline text and add notes. It has a 3D effect when turning pages. You can search the books, use the dictionary , search geographic information, select day, night or sepia reading mode. In addition, you can select the type and size of the letter , listen to the books if the editor has enabled voice synthesis and upload PDF files to your library. It can be downloaded on both Android and iOS. The Kobo Reading App allows you to browse Kobo’s extensive catalogue of the world’s best eBooks, comics and children’s books and read them conveniently on your smartphone or tablet. Search by author, title, topic or genre to discover your next great read. Customise the way you read. Enjoy crisp, clear text and adjust to the size and style you prefer. Try Night Mode to make reading easier on your eyes before bedtime, and lock the screen in portrait or landscape mode to read how you like. Discovery is easy with personalised recommendations based on your reading habits. Plus, read free previews for thousands of eBooks to help you find your next great read. Pick up right where you left off and never lose your spot. The Kobo Reading App will automatically sync your bookmarks, notes and highlights, so you can keep reading across all your devices. Share your love of reading on Facebook, Twitter and Instagram. Post your favourite quotes, notes, and thoughts from the eBooks you’re reading. Get this app on both Android and iOS devices for free. Last but not least app to read books on our mobile phones, is Aldiko book reader. This app support EPUB, PDF formats as well as Adobe DRM encrypted eBooks. It also supports ebooks from public libraries. This app is Fully-customizable for reading. You can adjust the font size, font type, font and background colours, margin, alignment, line spacing as well as brightness, night mode to best suit your preference. It has a user-friendly interface. You can create your own bookmarks anywhere in the book, rapidly jump to a different section of the book through the table of content. Advanced library management system. You can import your own EPUB and PDF files into the app to read them on the go; organise your eBooks by tags and collections. Aldiko will also remember your reading position automatically, bring you back to where you left off. Download this app on your Android smartphone and iOS device. These are the five best apps to read books on your mobile devices. I hope this article helps you in a good way to read your books with good comfort and flexibility. If you have any issues in downloading the apps or any other issues regarding the above apps, let us know in the below comments. If you are already using any of these apps, share your experiences with our users. Would you like to add any other app to read books on digital devices? Then comment below. Which app do you use to read books on Mobile phones or Tablets?